Prototype: 4 different design German Federal Railroad (DB) express train passenger cars. Version for the train route D 182: Hannover – Herford – Hamm (Westph) – Dortmund – Essen – Duisburg – Dusseldorf – Cologne. 1 type Bue express train passenger car, 2nd class. 1 type WR4ü39 "Schurzenwagen" / "Skirted Car" express train dining car. 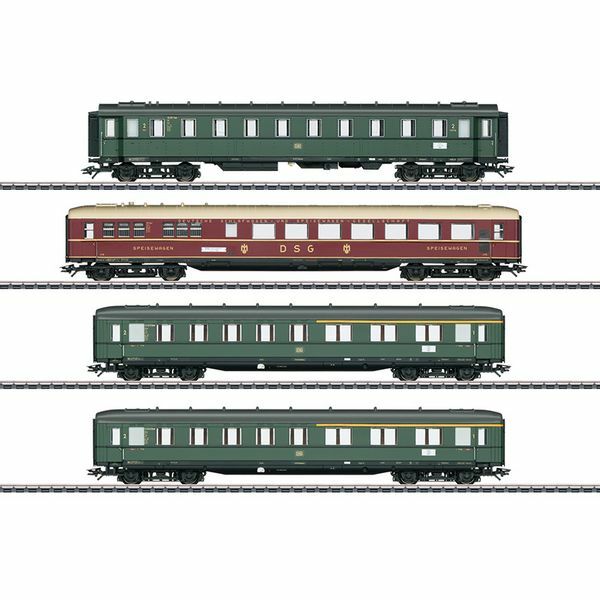 1 type ABue "Schurzenwagen" / "Skirted Car" express train passenger car, 1st/2nd class. 1 type Bue "Schurzenwagen" / "Skirted Car" express train passenger car, 2nd class. The cars look as they did around 1966. The right express train cars to go with the class 18 505 steam locomotive. Train route D 182: Hannover – Herford – Hamm (Westph) – Dortmund – Essen – Duisburg – Dusseldorf – Cologne.